Munch brings together two of our greatest passions in life - travel and food. For us, food is an experience, a memory, a hit of culture, and something that undeniably tastes better with friends. It’s a universal language that anyone can speak, and a way of experiencing a destination in an entirely sensory way. 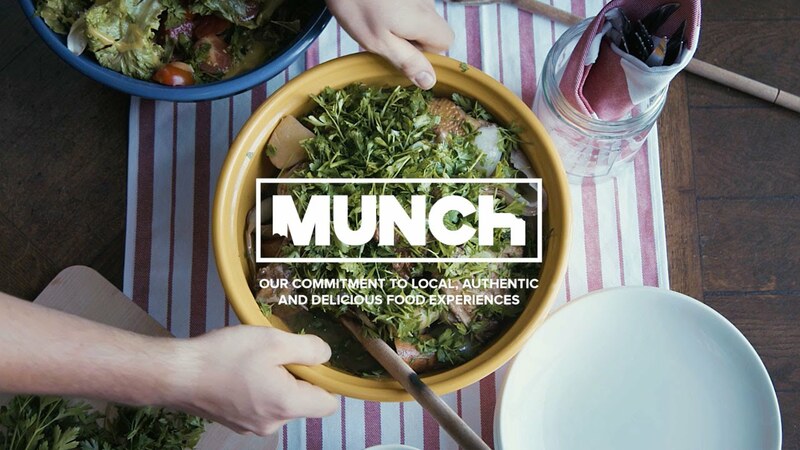 Our Munch food philosophy is integral to every single Contiki trip. Our Trip Managers are obsessed with it, each one possessing a Little Black Book of their favourite local foodie haunts (which they’ll happily share for the price of a smile), and our itineraires are reflective of it, often bursting with meals and experiences designed to get you eating, drinking and cooking the flavours of the world. In a nutshell? Munch = utter deliciousness on your travels. So you’re in Italy, what are you gonna eat? Soggy sarnies on the road side? Hell no; you want fresh pesto, perfectly salted Tuscan stews, exquisite pistachio gelato. You want authenticity, and so do we. Those who have travelled far and wide know the most direct route to a country’s heart is through its cuisine, so that’s why wherever in the world you are with us, you better believe you’re gonna be eating authentic. That means hotter than hot curries in India, butter milk southern fried chicken in Nashville, 3am poutines in Canada, freshly caught fish down under...you get the picture. Authentic is what we do, and authentic is what you’ll get. In a continent housing 50 different countries, Europe is variety at its best. So how do you experience it all? That’s where Munch comes in. We’ve partnered with esteemed Danish Masterchef Thomas Castberg to create bespoke menus in each of our European special stay properties that put regional flavour centre stage, and that’s not all. As well as having a tasty breakfast included every day on trip, you’ve also got an eclectic range of foodie experiences to pick from; think a 5 course Italian feast in Burano, or a EatWith experience in London, Barcelona, Berlin and more.